The other day two acquaintances of mine were discussing how revolting it is that Americans drink their tea cold. Both of these ladies are from other parts of the world, they both have very friendly dispositions, and between the two of them they speak seven languages (English is their only commonality). Also they apparently detest tea served cold. Yes, I told them. I drink it all summer long. Now I want to pause here so you can imagine two perfectly horrified expressions pointed right at me. What followed was numerous, loud exclamations of surprise and dismay but I can’t tell you what they said becasue it was in a mix of Spanish, French, Arabic, and possibly Berber. None of which convinced me to give up drinking cold tea in the summer time. I call it sun tea, because I brew mine in the sun. All summer long I have a collection of re-purposed jars out on my porch soaking up sun and brewing me some tea. Now I’m not alone in my appreciation of tea served cold of course. Its a thing is Texas, in the entire American south. Southerners drink it all year long (for me its strictly a summer thing) and if you have spent any time in the south then you already know we are mighty particular about our tea. In Texas it comes sweetened and unsweetened and if you are serving tea you better be clear about what you are handing out. Those unsweetend tea drinkers get onrey when you give them sugary tea. But if you find yourself in Georgia, its all sweet. Sweet tea practically runs in their veins. Yep across the American south sun/iced/cold tea is a way of life and we are currently drinking enough of it to float naval battleships. So let’s have some sun tea shall we? You’ll need a glass of ice. Then pour that sun-warm tea in and listen to those cubes crack! Makes your mouth water doesn’t it? You know what else will be watering? Your glass. Its hot outside (the temperature on this little porch is 99 deg F) and that glass of tea will be sweating in approximately 7 seconds. 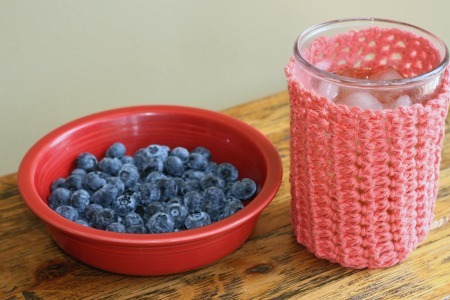 You need a cozie, a thick cotton crochet cozie, so you can drink cold tea while keeping your hands nice and dry. 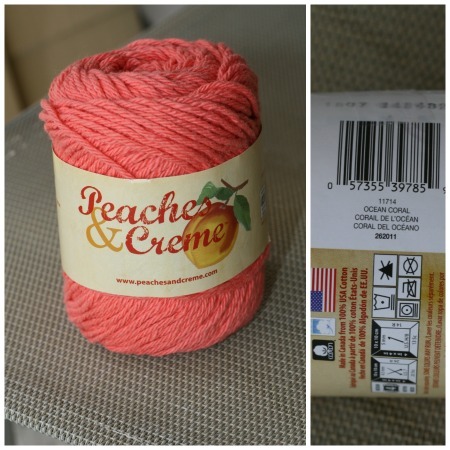 What you need: Some worsted weight cotton yarn and a US H (5mm) hook. 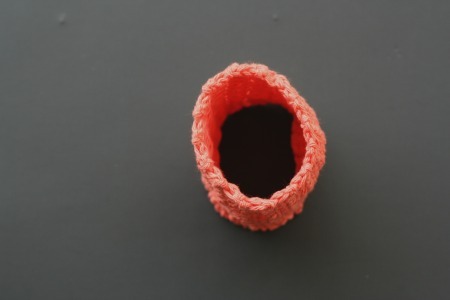 The cozie is made with a simple stitch that works up to be stretchy. Stretchy is a good thing in a cozie. You’ll want this to fit more than one glass after all. 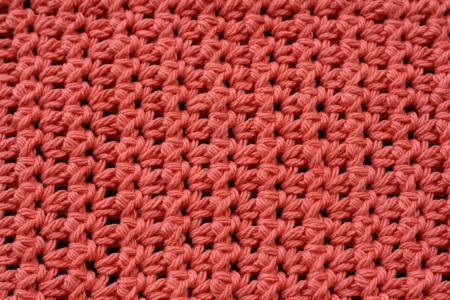 This pattern uses US crochet stitch conventions. 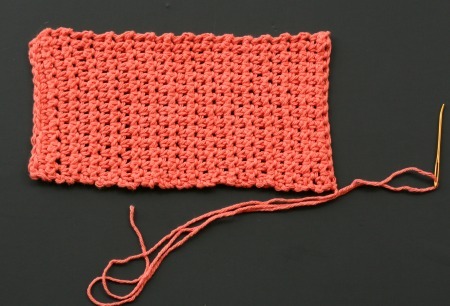 Here is a handy US-to-UK stitch name conversion chart courtesy of Simply Crochet magazine. 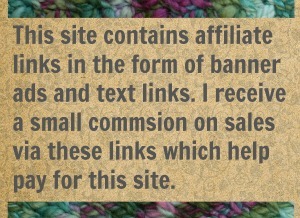 US – UK crochet conversions from simplycrochetmagazine. To begin, chain… any number you like. 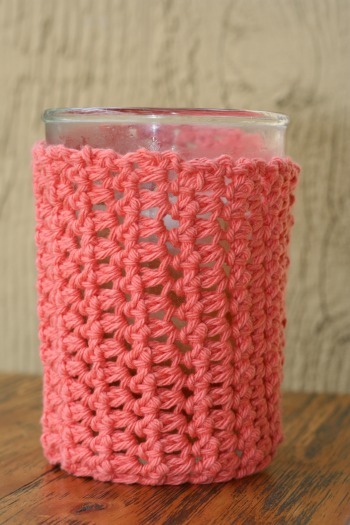 This pattern will work with any number for a base chain so make yours as tall as your glass. I chained 15. Repeat Rows 1 & 2 until your piece will stretch around your glass. 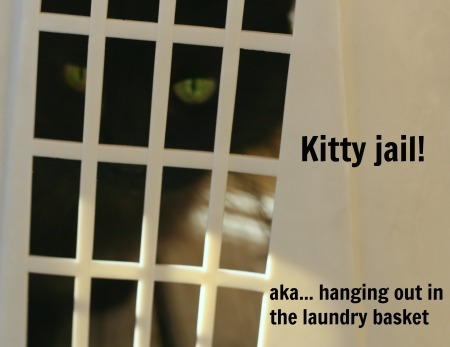 Leave a nice long tail to sew up with. Sew the final row to the starting base chain edge. Pop your glass of sun tea right in! 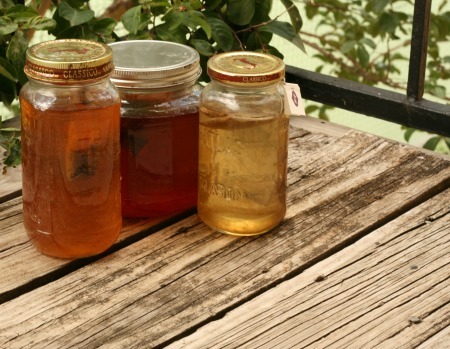 Sit on your porch and enjoy your cold tea like a real southern American… without getting your hands wet. Serve sweet or unsweet, with lemon, lime, or blueberries. Well, the blueberries are a bit nontraditional but last weekend my grocery store had blueberries on sale for 97 cents a pint. I bought four pints. I couldn’t help myself. Now I have to eat all these blueberries before they go bad. I know. My life is hard. Enjoy your summer cozie and if cold tea makes you feel queasy (btw, how many languages do you speak?) then you can always put something else in that glass. Beer maybe. I hear some people drink that in the summer time. 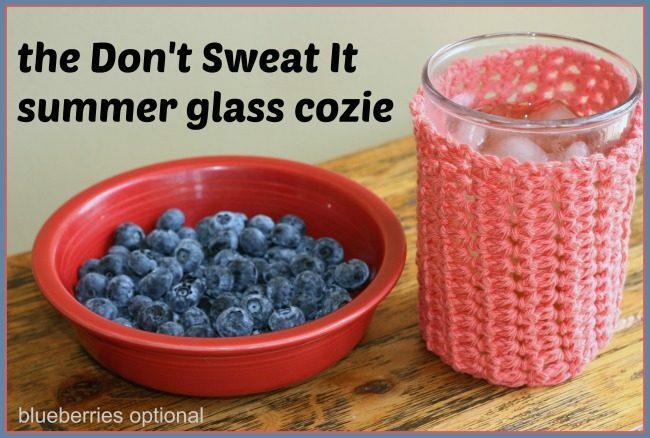 12 Comments on "The Don’t Sweat It glass cozie – free crochet pattern"
Perfect! Thanks and BTW there are people out there that drink warm beer and frown on beer served cold too. I don’t do beer but love iced tea! I guess I’m the same. I’m not a big fan of beer and the idea a drinking it warm makes me shudder. Enjoy your tea and your cozie! You don’t have to live in the south to drink iced tea, whether it’s made in the sun or the microwave. (Hey, we have shorter summers!) We must protect our valuable glassware from wet, slippery grasps. This pattern should make up quickly enough for that. Thanks. And you don’t get enough sun to make sun tea? That makes me think “brrrr, must be chilly”. But tea is a good choice no matter how its made right? Right. And so much better for you than a coke. Its grand that we can drink tea any ol’ way we like. that is for certain. 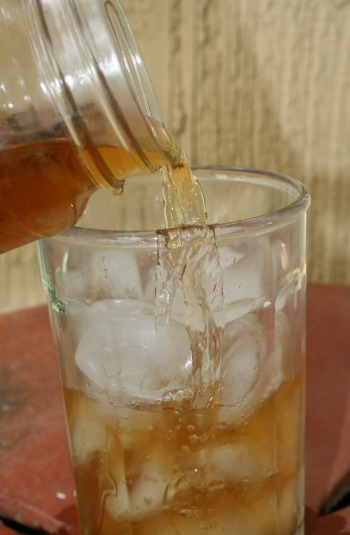 Did you know that the first (published) cold tea recipes were alcoholic? Those British types in the 1800’s would brew tea and let it come to room temp. Then they’d mix in champagne or wine and pour it over ice and serve. It was called tea punch. You’re thinking about trying it aren’t ya? Hmm my message got eaten by electronic moths 😄 For those that live where ice is needed, make your tea double strength then freeze in those big square ice cube trays. 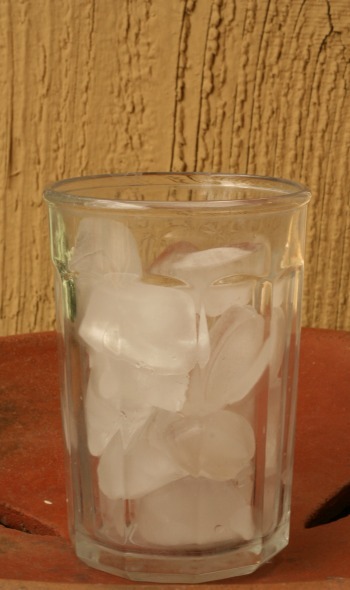 The tea stays cold longer, and the ice doesn’t dilute it! Ah ha! You are one of those serious sun tea drinkers! You got the tea hacks and everything! I speak two languages, English and Welsh. I don’t drink iced tea but often drink my tea cold because I’ve forgotten about it while knitting. That’s precisely the way I drink my coffee. Forgotten coffee gets cold but I drink it anyway!